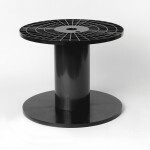 Plastic Spools – Pittsfield Plastics Engineering, Inc. Typical applications for plastic spools are coaxial cable, speaker wire, THHN wire, CATV wire, hose, tubing, chain, rope, and fabrics. A broad range of flange diameters (5″ to nearly 20″) are available for our plastic utility spools. 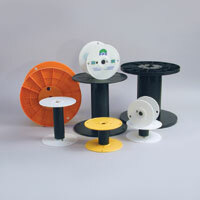 All our spools come with adjustable barrel traverses to achieve the optimum spool capacity. Pad printed flanges are available. *Available in a breakdown spool or standard utility spool. Available as 15 1/2″ or 18″ We also make custom spools and reels to your exact specifications, If you have any questions we would be glad to get you answers.